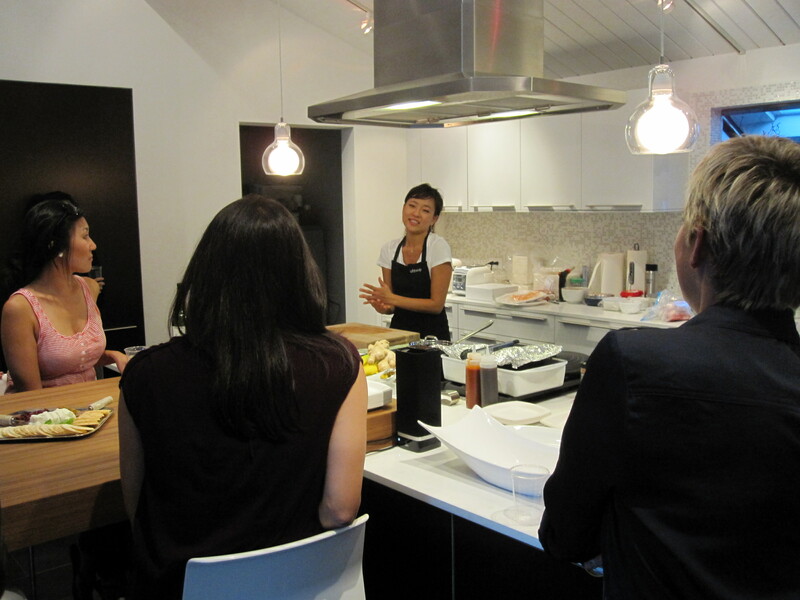 Thanks to bulthaup who sponsored my first cooking class and thanks to those 16 guests and friends who attended. I had such a blast at the event filled with good food and wine and great conversations. 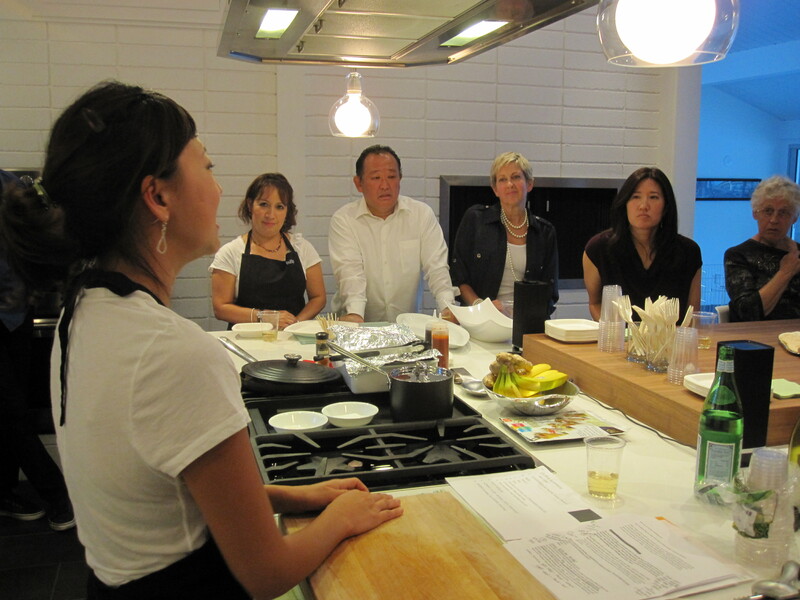 And unlike other cooking classes, I focused on the art, science and emotion of taste. Tasting is a fascinating subject for me…and for many – if you care to think about it. Our ability to taste (salty, sweet, sour and bitter) is actually supported by biological reasons. Really! Salt – our body needs it to regulate muscles, nerves and blood pressure. Sweet – carbs like sweet fruit converts into energy. Sour – Vit C and other essential Vits that help with cell production, immunity and more. And Bitter – actually a survival/protective sense we developed to avoid poisonous plants have evolved now to balance out flavors and cleanse your palate from one bite to another. Can you think of some bitters? How about arugula (one of my fav veggies), artichoke or even spinach? Just like everyone sees or hears a little different – so do each person’s taste. What you may think is just right may seem a little salty to me. And it’s because our taste buds sensitivity is a little different from one person to another. And some of us have a higher affinity for certain taste (eg., Spicy..Linda?) while some others have a lower threshold for other taste (eg., Beets…Jamie?). It’s genetics-based but our taste profiles change over time – which is why a kid may start out to be a very picky eater but as they get exposed to different foods – may start to like something they never thought of touching before. Lastly – in addition to the 4 elements of taste (salty, sweet, sour and bitter) – there are many other tastes that we’re able to detect, some which you may not have considered to be a taste. Umami/savory, fat, spicy, smells (herbs, lemon, smoky, fishy…), texture, color and even sound (of various textures) as you’re chomping down your perfect bite. And it’s the combination and just the right RATIO of these tastes that gives you a PERFECT BITE and what I tried to teach during the class last night. Some of the crowd pleasers included the “stick-y” bites…of green grape wrapped with smoked salmon and dipped in basil vinaigrette, roasted beets smeared with goat cheese, topped with orange section and mint, and overwhelming favorite, paper-thin sliced proscuitto with cantaloupe, persian cucumber and mint. This entry was posted in becoming a chef, Chef Kelly and tagged appetizer, bulthaup, cooking class, kalbi, korean cooking, perfect bite. Bookmark the permalink. Chef Kelly outdid herself at this amazing event! Everyone not only learned a thing or two about cooking ratios and flavor, but enjoyed delectable foods with the Korean touch. 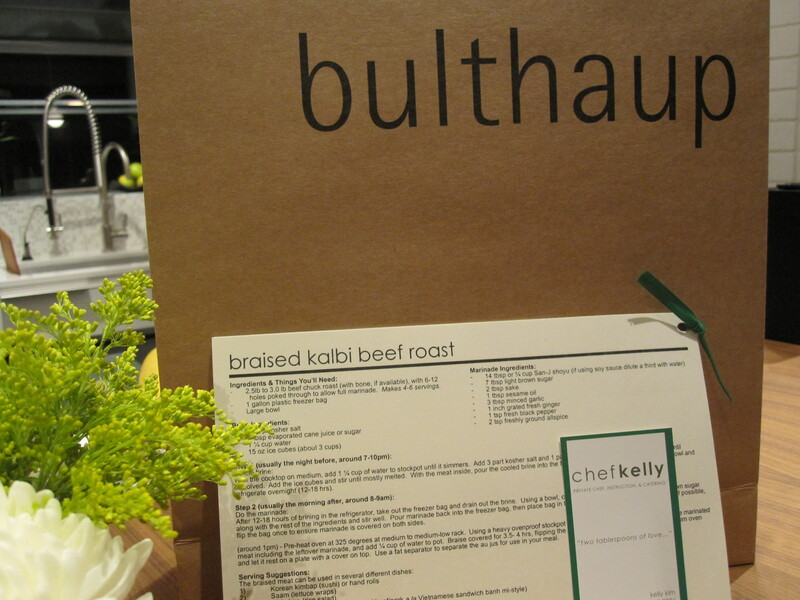 Thank you Chef Kelly and Bulthaup! I can’t wait to try the spices at home.